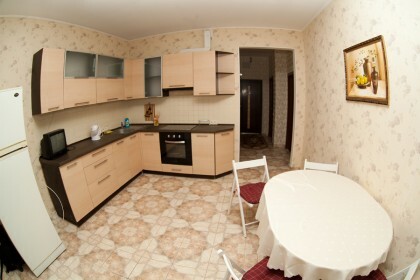 Three room/ two bedroom apartment in the new apartment complex with shopping mall, restaurants, cafes and cinema. 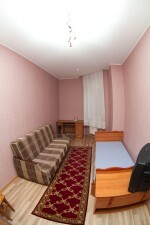 Spaceous three room/two bedroom nonsmoking apartment in the new building complex “Chudo Gorod”. First bedroom with a king size bed wardrobe and TV. The second bedroom with single bed, pull out couch, TV and writing table. Livingroom with fold out sofa, arm chair and cofee table. Apartment is equipped with the following consumer electronics: 4 TV sets, cable vt, wi fi Internet, air conditioner, washing machine. Big shopping mall, restaurants, cafes and cinema are just steps away from the apartment building. The capacity of the apartment is 6 persons.